Airlines operating in Norway will be required to use environmentally friendly jet fuel mixed with biofuel from 2020, according to an announcement made by the Ministry of Climate and Environment. As part of Norway’s push to cut greenhouse gas emissions, the government said the aviation fuel industry must mix 0.5 percent advanced aviation biofuel into jet fuel from 2020 onward, a move which will force airlines to use more costly fuel. The government’s goal is for 30 percent of airline fuel to be sustainable with a good climate effect by 2030. The government is also requiring the airline industry to use second-generation biofuels, which is a product of waste and leftovers and cannot be based on palm oil. Palm oil production is one of the key drivers of rainforest destruction in Southeast Asia and South America. 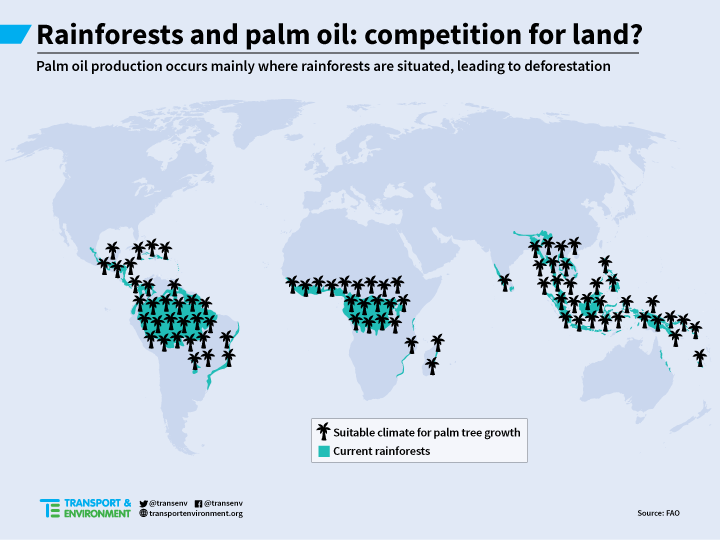 Almost all oil palm grows in areas that were once tropical forests (see below map). The environmental destruction threatens biodiversity and increases greenhouse gas emissions. The change equates to the use of around 6 million liters of advanced aviation biofuel, costing around two or three times more than regular jet fuel. However, prices are uncertain because there is no current market for biofuels in aviation. This is the first bill introduced worldwide to use biofuels in aviation. It is expected that the 0.5 percent biofuel will correspond to a price increase for the airlines of around 54 million Norwegian crowns or $6.6 million, annually. Aviation biofuels produced from renewable sources are expected to play an important role in delivering the goal of carbon-neutral growth in airline CO2 emission from 2020.